The NUCCA procedure activates your health by using a very light touch on your neck behind your ear. Our focus is on a small misalignment of the bone structure connecting the head and neck. This misalignment interrupts the vital communication between your body and your brain, resulting in pain, tension, stress, and overall physical and emotional dysfunction. A childhood fall, sports injury, illness, birth trauma or car accident can be the cause of upper neck misalignments resulting in many common health conditions. NUCCA gets to the cause of the problem no matter where the symptoms are in your body. NUCCA is extremely precise, and is unlike any other kind of spinal care you may have received in the past. Our doctors go straight to the biggest cause of pain and loss of function, the central nervous system. The brain stem is the central hub where all information entering and leaving the brain must pass through to reach the rest of your body. Many important functions such as breathing, heartbeat, digestion, sleep, coordination, and even blood pressure are controlled at the base of the brain. Even the tiniest misalignment in the upper neck throws the weight of the head off balance. 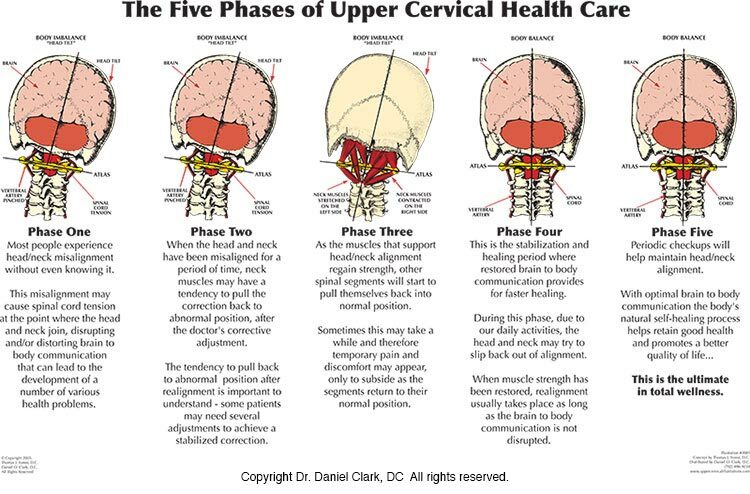 This imbalance puts pressure on the brain stem which is housed in the upper neck. A host of acute and chronic health problems occur when there is pressure in this delicate area. Your spine can get off balance and mis-align with any injury. Back pain, TMJ disorders, neck pain, headaches, migraines, mood swings, vertigo and high blood pressure are some of the conditions that occur with an upper neck injury. Your body minimizes tension in your spine by compensating with poor posture. The head protrudes forward or tilts to one side, the shoulders roll in, and the hips are twisted causing one leg to be shorter than the other. We specialize in NUCCA, a form of Upper Cervical Care, which restores your skull, spine and hips to their neutral balanced position. We are grateful for Dr. Ralph Gregory’s development of the NUCCA protocols 50 years ago. The Upper Cervical Research Foundation is the branch of NUCCA that continues to conduct ongoing patient education and research today. “I wish I had come to you sooner!” We hear this way too often when we meet people suffering needless pain, frustration, and unsatisfactory results when dealing with their chronic health problems. They feel annoyed, desperate, hopeless. We want to change that! Health is possible for you and your family at any age and at any stage! Our doctors help patients that have not been able to get help anywhere else. Proper nervous system function is critical to your health. We check your nervous system, see what’s blocking it, fix it and let your body heal and recover. We care deeply about our patients and are passionate about helping you get better. Dr. Jeanett Tapia and Dr. Devin Young are 2 of 275 National Upper Cervical Chiropractic Assocation members. Our doctors are not jack-of-all-trades. We focus on chiropractic and the NUCCA Protocols exclusively! Want expert care? Call our office today at (619) 313-5403 and find out if NUCCA is right for you.